It must be a carry-over from the holidays- a kind of "into-that" feeling we have over buco-pandan salad or the fact that we've always loved the dessert hence I've made it three times in less than two weeks dating back from New Year's eve. By the way, K asked me why it's called salad and I told her it is considered as one in the Philippines. It is in fact a modest member of the fruit salad family which consists of fruit cocktail, young coconut, nata de coco, kaong and cheese with table cream and condensed milk dressing. I remember tasting it for the first time at a party and knew right there and then that I'd make it too and better. 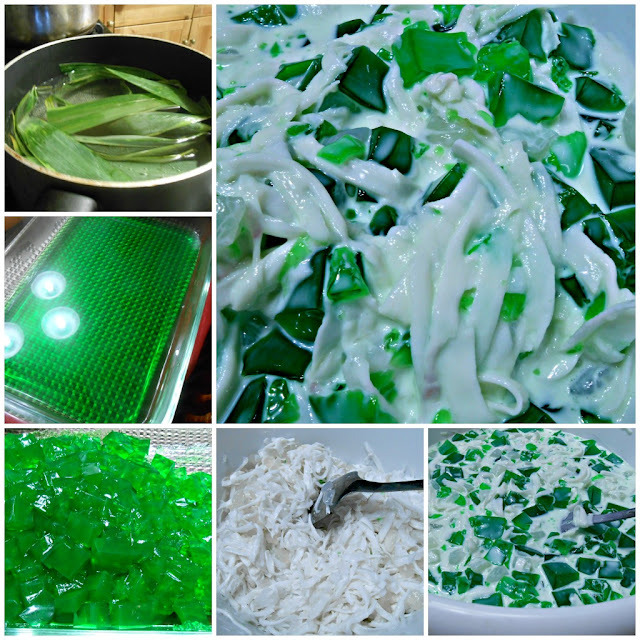 I only want three ingredients in it- shredded young coconut, nata de coco and the pandan gelatine. For a while I was on that heavy cream + condensed milk dressing bandwagon but realized that I prefer my dessert a little bit more soupy and not as rich. Hence I decided to use half and half with the condensed milk and with wonderful results and smiles of approval whenever I serve it. Bring water to a boil in a medium sauce pan. Add the pandan leaves and sugar and stir. Add pandan paste and continue to boil for a minute. 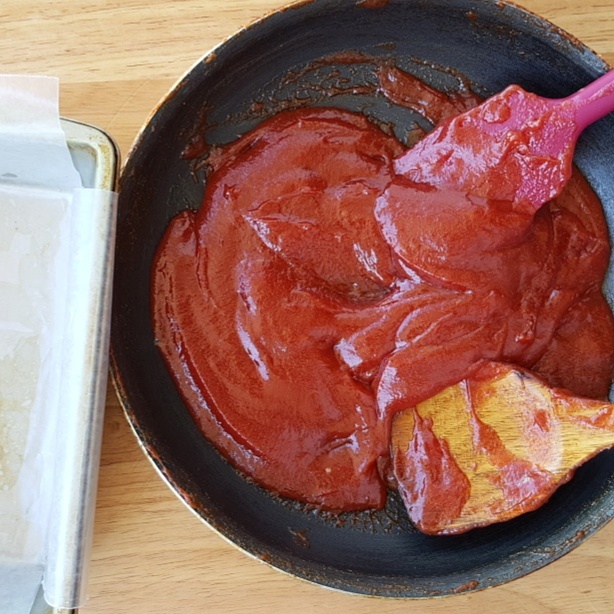 Remove from heat and stir unflavored gelatine. Pour over a fine strainer over a glass dish and allow to set. I used two to speed up the process. Cut into cubes using a sharp knife when it becomes firm. Using a large bowl, dump the gelatine cubes, nata de coco and shredded young coconut with the sweetened cream and gently toss together. Refrigerate overnight before serving. Tapioca pearls is a very nice alternative to nata de coco or having both is even better. Add a couple of drops of coconut or pandan extract into the cream dressing and your buco-pandan rocks even more. I have to update this post for additional tips to make this simple dessert a real crowd pleaser. 1. Use fresh young coconut but if you have only frozen one available, make sure to drain the meat really well. I keep it on a colander over a big bowl overnight. 2. Do not use canned pandan gelatine. It's so easy to make and can be done days ahead. 4. Using pandan paste to make the pandan water (for the gelatine) green because it enhances the pandan flavor. 5. Since this is supposed to be a flavor combination (pandan and buco/young coconut) you can add a couple of drops of coconut essence into the cream dressing to make it more flavorful. Trust me, when you toss everything together, it will be beautiful and delicious. 6. Tapioca is really starchy and absorbs a lot of liquid so if you are using a lot, you have to adjust the "dressing" lest it becomes too thick. Bring water to a boil in a non-stick pot (enough to cover the tapioca pearls and some more as it will absorb all the liquid as it cooks). Stir occasionally once it starts boiling and make sure to replace the water as it dries up and the pearls are not yet ready. They should be when they turn clear. Drain in wire strainer then transfer to a bowl to cool completely before using. 6. Tapioca is really starchy and absorbs a lot of liquid so if you are using a lot, you have to adjust the " dressing "lest it becomes too thick.